Moving Still is the most gorgeous, enticing, classic album of 2016 in jazz so far. Three years ago, trumpeter and composer Jonathan Finlayson released his first recording as a leader, a riveting collection of engaging, modern music for quintet. The tunes presented on Moment and the Message spliced together the joys of crackling hard bop, bits of folk and funk music, and the modern experiments of his mentors/forefathers, Steve Coleman and Henry Threadgill. It didn’t hurt that the band was astonishing and perfectly in sync with Finlayson’s influences and aesthetic. 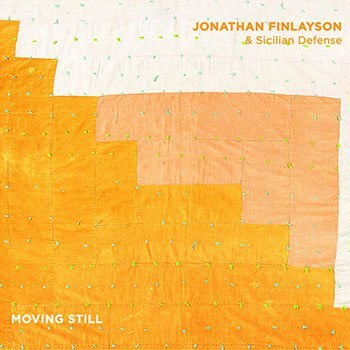 Moving Still brings back the same instrumentation and approach, and it proves that Finlayson is among the most exciting and puckish composers in the music today. This new collection may be an improvement on the first -- deeper in feeling while still jaunty, exceedingly clever, and able to cover lots of fancy footwork in joyous execution. This time out, the trumpeter is again paired on many melodies with Miles Okazaki, the versatile guitarist from Steve Coleman’s band. Matt Mitchell (a leader, certainly, but brilliantly showcased in Dave Douglas’s quintet as a player who is both soulful and abstract at once) is now the pianist, and the more you hear him, the more you fall for him. The rhythm section pairs veteran bass player John Hebert and the young Craig Weinrib from Threadgill’s latest recording. The band’s work here is panoramic: it swings and it gets strange, it has a little funk and it earns your dazzle. It starts off, perhaps surprisingly, with Okazaki playing a gentle, chordal introduction on “All of the Pieces” that might be at home on a folk ballad. The band enters with a grooving bass line of funky downward motion over which Finlayson plays a hip -- but quite simple -- melody on trumpet, which is then echoed by Mitchell’s piano. Nice. But the game of chase and follow is only starting. Piano and guitar converge for a unison run played against trumpet, which leads to a third line with the trumpet playing accompaniment as the rhythm section surges to the front. Does it sound exhausting to listen to? It’s not. The complexity here is so logical and melodic that it comes off as natural. Okazaki’s solo is as clear and sculpted as anything by John Scofield or Pat Metheny. This music, for all its trickiness, invites you in. Finlayson has found, in his writing and in the skills of this quintet, a bracing balance of lyricism and rhythmic intensity. Matt Mitchell embodies this, for example, in his playing on “Space And”. The song begins with the pianist playing echoing piano clusters and chords, ringing them in both the high and low registers. A minute in, Okazaki starts playing a Morse Code pattern on guitar that is joined in polyrhythm by everyone else, including a punching trumpet melody -- and it sounds like a hip drum circle, so rhythmic is the whole band. Mitchell finds his way to a ringing repeated Steve Reich-ian pattern that gets repeated after a bit by Mitchell and Okazaki together. Still, the tune belongs to the pianist, whose lead-off solo moves from a set of jagged licks to a fully realized melody that flows through the original pattern. There are moments when this band comes off like a downtown version of the Grateful Dead. “Flank and Center” begins as mostly groove and then gets more complicated. Weinrib starts with a dancing drum solo that culminates in a funky pattern of snare-click trades with two or three-note bursts of melody from trumpet, guitar, and bass/piano in a tight rotation. Eventually, the rotation breaks down into a collective improvisation, with Finlayson up top, but everyone else improvising in their own register -- the jam band effect is achieved, but at the highest level. By this point, however, the center of the tune has shifted to a flowing lyricism. The chaos never sounds like chaos. It is tight as can be, with the exploration both elastic and brief. Barely two minutes of improvisation and we are back to the groove. Long-form melody is then featured on “Cap Vs. Nim”. A melody written for all the instruments (including drums) in unison and octaves, this line features Finlayson using a mute. What is so keen about this, however, is that the melody ends up being inventive for some 50 or 60 bars, continually unwinding as a written theme for the whole band not repeating itself. Eventually, it gives way to much shorter improvisations by the players, but the track reverses the standard balance of a jazz performance, with a portion more written than improvised. The best solo comes from the leader, whose dialogue with his own written lines for piano become the counterpoint to his probing and ascending. Two other songs on Moving Still reflect the specific influence of a trumpet player whose imprint on jazz today is everywhere, always. “Between Moves” is a sneaky and brilliant piece of improvised impressionism. Beginning with fluttering improv from the rhythm section, it eventually builds into a modal jam that sounds just enough like Miles Davis’s “In a Silent Way”. The slow boil of the trumpet solo highlights Finlayson’s expertly modulated timbre on this record. While I have always associated him with a clear and quicksilver tone, here, he is more varied and expressive, using subtle tonal difference to express longing, passion, growth, and tension. The very next song, “Folk Song”, also leans on a feeling and push-pull rhythmic approach that I associate with the late records of Miles Davis’s 1960s quintet. Like “Frelon Braun” and the title track from Filles de Kilimanjaro, this last song has a surging sense of swing that lunges in little controlled bursts -- funky but also gentle. The openness of the sound and the inevitable feeling of harmonic motion in the composition keeps you feeling every note. That is a huge amount of ground for five musicians to cover in a half dozen compositions, but the work of Jonathan Finlayson and Sicilian Defense is ambitious. That it does not come off as mannered in its ambition is that much more proof that this is one of the brilliant projects in the music today. Moving Still is the most gorgeous, enticing, classic album of 2016 in jazz so far.